The Department of Art History, Visual Art and Theory is housed in several buildings on campus: the Frederic Lasserre Building, Auditorium Annex A, the Old Fire Hall, B.C. Binning Studios, Dorothy Somerset Studios, and the Audain Art Centre. Our facilities are located within the Arts & Culture District, which is also home to the Morris and Helen Belkin Art Gallery, the Frederic Wood Theatre, the UBC School of Music, the Chan Centre for the Performing Arts, and the Museum of Anthropology. interact with our specialized faculty and staff. Art history and critical and curatorial studies graduate students have access to a graduate lounge in the Lasserre Building, the Visual Resources Centre, and study spaces at the Music, Art & Architecture Library. The VRC is a vital teaching and research facility for our faculty and students, and services university communities through collaborative projects in E-Learning and Distance Education. It has total holdings of over 450,000 35mm photographic slides, videos, films, DVDs and a growing database of 60,000 digital images, covering all areas of art history and visual art as represented by the curricula of the AHVA Department and the Film Program. Please contact VRC staff at (604) 822-3802 or visit the VRC homepage for more information. Undergraduate Visual Art classes in Digital Art are primarily held in recently renewed labs in the Buchanan Building B Block. Drop in hours for VISA students are also available when VISA 110 classes are in session – please enquire with the instructor for details. The current instructor(s) can be found on the Courses page. 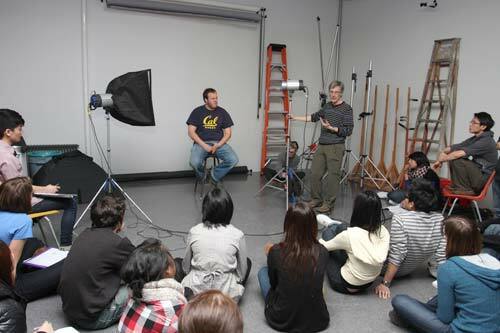 The Visual Arts Department offers an extensive photography and digital facility, which includes a photography studio with location and studio lighting systems, two black and white darkrooms, a black and white film processing area, a digital production room with video editing, image and film scanning, a large format inkjet printer and a video editing room. Students use the facilities for work sessions and critiques during their class time. In addition, students are strongly encouraged to use these facilities during monitored periods and by reservation for individual and group projects, and to work in both analog and digital photo technologies by the facilities. For additional information please contact the photo/digital technician Rob Bos, or visit the photography facilities homepage. 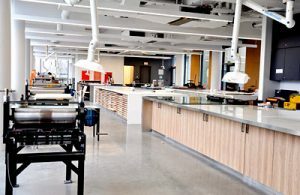 There are shared open studio spaces available on the 3rd floor of the Audain Art Centre for undergraduate 3rd year and 4th year visual art majors. BFA students have first priority in obtaining a studio space. Allocation of studios occurs at a meeting held in September, after which students are required to pay a studio and a key deposit prior to being able to access a studio. Each MFA student is provided with a private studio space (20.5 square metres approx.) on campus in our new facilities in the Audain Art Centre for a 2 year (24 month) period. In addition, there is an open multipurpose common room adjoining the studios and computer room available for the exclusive use of MFA students. MFA students hold Open Studios around the second week of December. Students normally distribute invitations and posters in advance – inviting faculty, staff, undergraduates and the general public to their studios to view their work. The evaluation of students’ artwork by Visual Art faculty members also corresponds to these Open Studios. 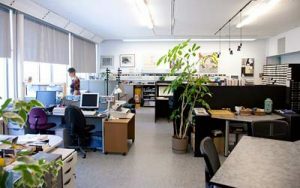 The UBC Printmedia Research Centre (PRC) provides a dynamic learning and research environment for the production of visual art in all major print media. This well-equipped facility allows for an integrated approach to print media that fosters a union of digital-image generation with traditional and contemporary intaglio, relief, screen and lithographic printmaking processes, as well as letterpress and bookbinding procedures. Students are encouraged to explore aesthetic, theoretical and cultural issues through innovative visual means aimed at advancing the study and critique of contemporary culture. Cognizant of the current worldwide renaissance in print media, programs provide a broad contemporary, historical, and theoretical perspective on the expressive potential of print. For additional information please contact the PRC technician Ian Craig, or visit the PRC homepage. Professor Richard Prince working with student Jeneen Frei Njootli. The AHVA Workshop provides support for a wide range of student and faculty projects, alongside ongoing technical support for departmental operations. Staff at the AHVA Workshop are able to provide support around many visual-art related processes, such as canvas stretcher construction, and small-scale sculpture in wood, plastic, metal, and plaster. All users of the shop receive instruction and ongoing guidance in the safe and effective use of equipment and processes through a detailed system of safety orientations and demonstrations. Students and faculty are able to access stationary powered equipment in the shop and may also sign out some smaller hand tools for up to a week. The area technician also can provide technical support, table saw cuts, and one-on-one consultation. For additional information please contact Frances Hart D’Emilio, or visit the shop homepage. Audain Art Centre, 6398 University Boulevard, Room 1001. This 2000 square foot purpose-built, contemporary exhibition space serves the Visual Art, Art History and Curatorial Studies programs of the Department of Art History, Visual Art and Theory at the University of British Columbia. Providing a site for student and faculty artistic and curatorial collaborations from within the department, the university as a whole and with artists and art students outside the university community; the Gallery allows for interactions on issues relating to art, culture and creative research. Each academic year the Gallery provides a showcase for the work of student, faculty and other professional artists through the BFA, MFA and Faculty exhibitions as well as selected curatorial projects. AHVA Gallery hours during exhibitions (September to April) are 12 to 4pm, Tuesday through Saturday. For more information call (604) 822-4563 or visit the homepage.